« Have You Made Your Grains Whole? Know How Much You’re Spending– When you spend $60 at the supermarket one week and $100 the next, you may not realize that your monthly grocery bill is one of your biggest expenses. Save your receipts and analyze them – you will be amazed at how much you spend on groceries and how much you can save by shopping more carefully. Take the time to create a food budget and follow it. Plan Every Shopping Outing- Experts say that planning meals in advance and making detailed shopping lists can cut your grocery spending by 20 percent or more. Check your pantry before you go shopping to be sure of what you need. Review store flyers and build your list around what’s on sale and the best coupon deals. 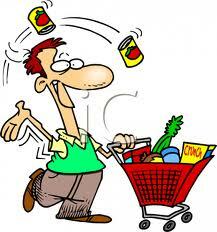 Stick to Your List- Grocery stores are designed to entice you to buy more with irresistible marketing. By sticking to a list, you will only purchase what you need and “get in and get out” of the store quickly. Do Not Shop on an Empty Stomach- If you go to a supermarket hungry, you will most likely purchase more food than you need, including expensive items as well. Beware of End Caps- Food items on aisle “end caps” are often attractively displayed to entice shoppers to make additional purchases; these displays are not always a shopper’s bargain. Look Up, Look Down- Items on the upper and lower shelves are often cheaper. Big brands often pay big bucks to have their products at eye level. Cook Once, Eat Twice- Plan meals with recipes that can be doubled easily. Serve one and label and freeze the other for a later date. Often it doesn’t cost much more to make a double recipe. Use this same food for lunch to reduce spending excess dollars on lunch. Consider Eating Less Meat- Make at least one or two meatless meals each week. Cruise Through Your Fridge Daily- Check foods on hand to plan to use them before they go bad. Watch the Cash Register- Checkout errors can be costly. Use supermarket discount cards to save. Don’t Pay Interest on Food Bought on Credit Cards- This only increases the cost of food even more. While you can’t control the cost of fuel or food, if you manage your food dollars wisely, you will have more money in your wallet at the end of the month.